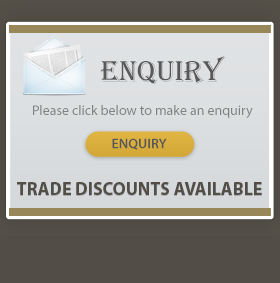 We have a wide selection of classical antique furniture, which you can browse using the menu to the left. All of our furniture is handcrafted using traditional techniques from mahogany that has been grown through a government plantation program. 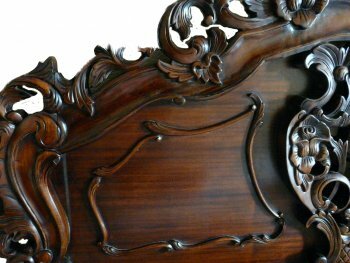 No two pieces are the same - every piece of furniture is individual, and a study of the detail and fine hand carving invite ownership by the discerning. 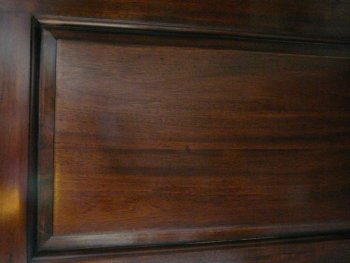 The use of mahogany results in a richness of finish to highlight natural grain and depth of colour found in all high quality furniture. Complimenting the use of beautiful timber are the fittings of bright and antique brass. A further enhancement is achieved by using quality bevelled glass, where applicable. The quality of the finish on all our products is exceptional. It is always wise to verify the finish quality before committing to buy this type of furniture from any supplier. We are happy for you to see samples of furniture at our Edinburgh showroom. We supply as standard in the 'Tea Brown' colour - see below. The advantage of this is that everything you buy from us will match and so can be placed alongside any piece we supply. Please note that the photos on this website vary in colour somewhat. They have been taken by different people at different times and in different lighting situations. The photos below have been taken by us and are of stock items that we currently supply, so give a true representation of the colour you can expect. We are located in Scotland and we welcome all visitors who would like the see the quality of our furniture for themselves. You can arrange a viewing at our Edinburgh showroom. Please contact us to make an appointment. We are able to deliver in mainland UK only. We deliver some orders personally so that we can ensure your complete satisfaction with your purchases. For long distances we only send furniture via our carefully chosen courier.